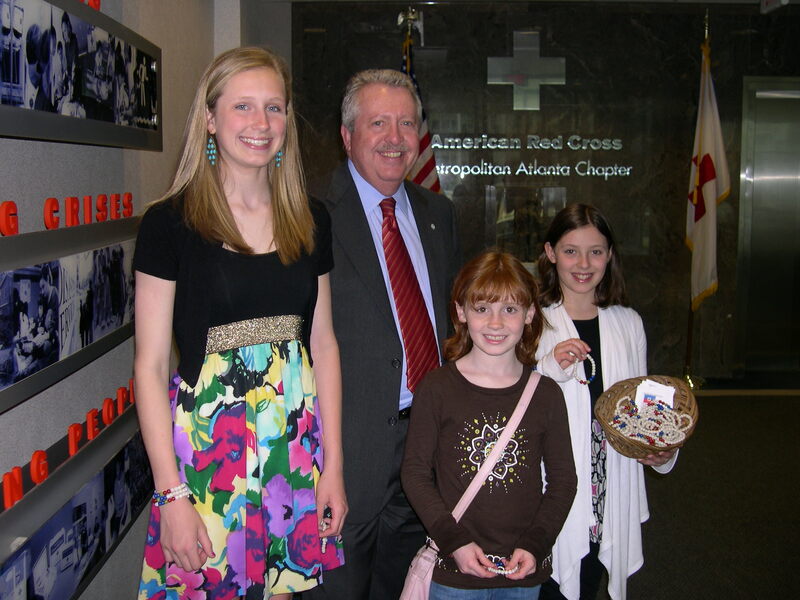 Metro Atlanta Red Cross CEO Tim English (center) welcomes and thanks local humanitarian entrepreneurs (l to r) Anna Richardson Ellis, 14, Clare McGrath, 8, and Shelby Salisbury, 10 for the money they are raising for Red Cross Haiti Relief by making and selling Sonje Bracelets. Saddened by the images of Haiti on television following the January 2010 earthquake, a young Atlanta girl, Shelby Salisbury, 10, asked her mom if they could do something to help. They came up with the idea to make and sell bracelets – in the colors of the Haitian flag. They hoped the jewelry would serve as a reminder that the people of Haiti will need help for years to come. They also talked about what to do with the money they made. In one of the news reports, Shelby heard that the Red Cross was responding to the earthquake. After some discussion about the role of the Red Cross in disaster relief, it was settled. They would sell the bracelets and give the money to the Atlanta’s Red Cross chapter for the Haiti Relief and Development Fund. “At first, it was just me and my mom, stringing beads,” said Shelby. Soon, Shelby enlisted the help of two, good friends, Anna Richardson Ellis, 14, who had also been working on plans to help, and Claire McGrath, 8. The girls feared that when the heavy media coverage ended, the people of Haiti would be forgotten. After a little research, the project was officially named, “Sonje Bracelets for Haitian Relief” as “Sonje” means “remember” in the Haitian Creole language. Using their evolving marketing and sales skills – with some suggestions from their moms – and the amazing reach of the social media site, Facebook, the group is well on their way to building a small empire! Requests for the bracelets – and touching notes of thanks and encouragement – are coming in from all over the country. “It feels really good to make a difference,” Anna said. They held an “official business meeting” and set a new goal of raising $5,000.00 for the Red Cross. Knowing this would mean a lot of bead-stringing, they partnered with members of Girl Talk, a student-to-student mentoring program, and classmates at Holy Innocents Episcopal School. The girls have learned that it comes in handy to wear the bracelets! They sell them right off their wrists at school, church, in their neighborhood and even at their parents’ dinner parties! On one such occasion, a young man wanted to buy a bracelet, and when it wouldn’t fit his wrist, the larger-sized men’s line was born. Thus, when the Sonje Bracelets for Haitian Relief team brought their first donation of $1,200 to Atlanta’s Red Cross in late March, the bracelet that CEO Tim English purchased fit perfectly. Claire and her two partners beamed. Sonje Bracelets for Haitian Relief are made of marble beads in the colors of the Haitian Flag, surrounded by white beads to symbolize hope and compassion. They sell for $15 each and all proceeds go to the American Red Cross for Haiti Relief and Development.